After successfully finding an apartment on Saturday afternoon Daisy realized that suddenly Sunday was open for studying which meant that for me Sunday was open for birding. Sweet! 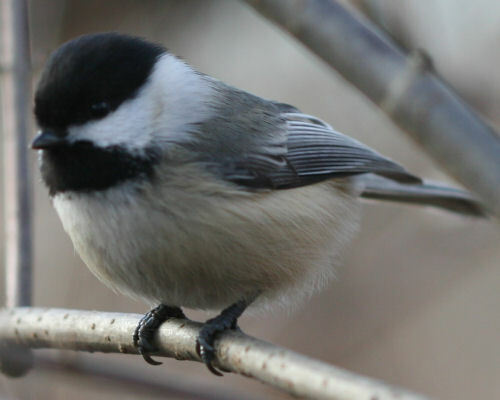 A quick call to Mike confirmed that he could bird Van Cortlandt Park, which is conveniently located along the Major Deegan Expressway, the route I take through the Bronx and Westchester on my way back to Albany from the city. So I found myself pulling into Van Cortlandt Park’s golf course parking lot Sunday morning and seeing a cloud of House Sparrows waiting to meet me. Mute Swans, Mallards, Canada Geese and Hooded Mergansers were visible by the time I was out of the car and a couple Ring-billed Gulls did a fly-by to see if I was offering anything to eat. I had arrived early so I had a half-hour to get my bearings and sneak some species before Mike would get to the park. I have birded Van Cortlandt Park before but only in the northwest part of the park along the Cass Gallagher Nature Trail. 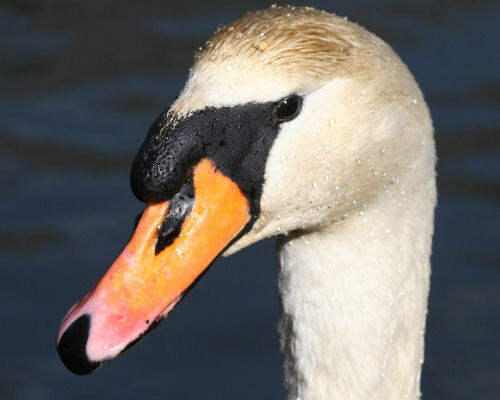 Mike is much more familiar with Van Cortlandt Park, which is the third largest in New York City and is suspected of hosting breeding Green Herons and Eastern Screech Owls. I saw neither of those species while waiting for Mike but I did see lots of common birds for New York City in winter and a couple not-so-common, like a Merlin and a Winter Wren. 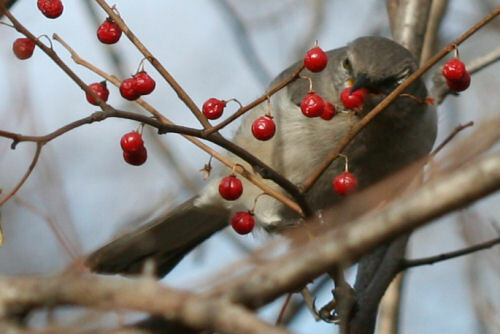 The birds were almost entirely focused on eating, like the Northern Mockingbird below, perhaps sensing the cold front on its way. 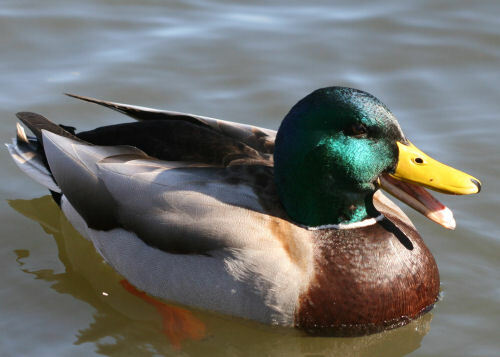 When I met Mike back at the parking lot at the civilized hour of ten o’clock he immediately picked out some Ruddy Ducks in the lake that had escaped my notice. He led me along the lake shore and over the bridge to where the Rusty Blackbirds would hopefully be. They were not. We were overrun by White-throated Sparrows and Black-capped Chickadees that were seemingly under the illusion that we were there to feed them, however, and Red-winged Blackbirds, a Great Blue Heron, and a flock of six Green-winged Teal were new birds for the day. Our walk continued, we enjoyed watching a skunk meander across the golf course, probably because it was walking away from us, and we put our binoculars on every raptor heading by overhead only to find that each one was a Red-tailed Hawk. Passerines were only gathered in weedy patches where seeds were available, around the water where who-knows-what-exactly was there for the eating, or where berries remained, berries that I imagine are still present in February because they probably aren’t very good. 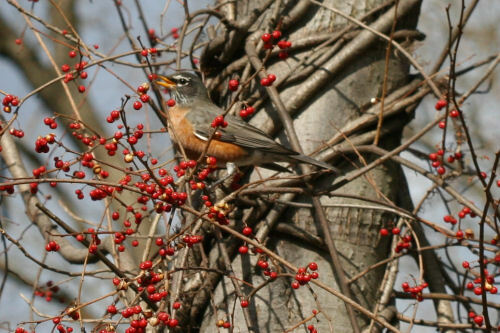 A large flock of American Robins sprinkled with some European Starlings didn’t seem to mind: they were gobbling the berries down as if they were delicious. A return visit to the Rusty Blackbird spot netted us two of the boreal breeders flocking with some Red-winged Blackbirds. A visit to the boardwalk through a marshy area near the parking lot revealed that vandals had burned a good chunk of the boardwalk but we persevered and tracked down our first American Tree Sparrows of the day. A quick stop back at the pond didn’t net us any new waterfowl species but Mike did spot a flyover Turkey Vulture and a Canada Goose carcass hanging by its neck high in a tree over the pond. As far as we could figure out the bird must have flown into the tree at a rather high velocity and managed to wedge its head between two branches and hang there until it was dead. There were no marks on the bird and no other way we could imagine that it got there. Talk about giving up the goose! Like the Photos, Corey. You have come a long way in the time I’ve know you. 20 years from now, you’ll be awesome. amazing photos and I love the mockingbird photo! Great Action shot for sure! Shouldn’t be too long before my robins return!